FILE - Ivanka Trump, daughter and assistant to President Donald Trump, and her husband, White House senior adviser Jared Kushner, walk out to join President Trump aboard Marine One helicopter at the White House, in Washington, May 19, 2017. U.S. President Donald Trump's oldest daughter, Ivanka Trump, is closing her fashion line to focus her energies on advising her father's White House, she said through a representative on Tuesday. Trump, whose fortune comes from real estate development, came into office carrying a broad family business portfolio that trades heavily on the family name. "After seventeen months, without a time frame for her return, Ivanka made the difficult decision that to be fair to the brand's partners and its employees, the business should be wound down," a representative for Ivanka Trump's fashion line said in a statement on Tuesday. 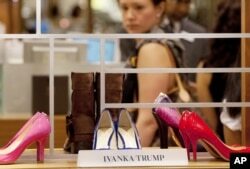 FILE - Shoes from the Ivanka Trump collection are displayed at a Lord & Taylor department store in New York, Aug. 23, 2012. The company said licensing contracts would not be renewed and those in place will be allowed to run their course. Trump's combative style on the campaign trail and as president have drawn the family's brands into political fights, with some supporters hosting events at the luxury Trump International Hotel blocks from the White House while opponents have called for boycotts of the family's businesses. In early 2017 retailers including Nordstrom, Sears and Kmart dropped or sharply scaled back their assortment of Trump-branded products, though they typically attributed those decisions to poor sales rather than political messages. Ivanka Trump's brand said in a statement that retailers including Bloomingdale's, owned by Macy's, Dillard's and Amazon.com continued to carry her wares.